filled to capacity. People often do not think about cabinet organization until after they have installed the new cabinets. Then you have solid wood kitchen cabinets with lovely counter tops and you do not want to do anything that will mess them up. 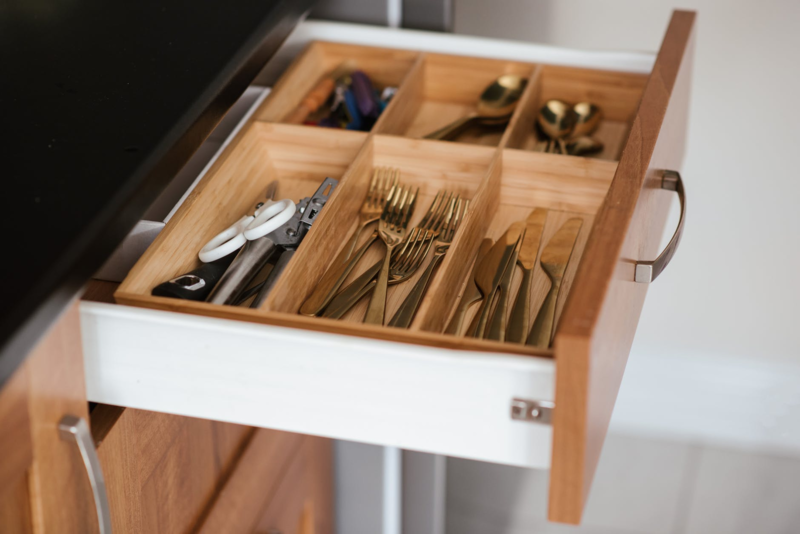 Well, you can relax in knowing that there are ways to get and stay organized that will enhance your space management and will not damage your cabinets, pantry, or drawers. In virtually every kitchen organization article you have read, you have been told to organize with wooden drawer inserts. Some are from the lower left corner to upper right corner. Others are verticle and finally horizontal. Yes, these are good solutions to drawer clutter. There are other uses for drawer space. One example is a drawer with electrical outlets inside the drawer. It serves as a docking station. Place your phone, laptop or notebook in the drawer. It is out of the way and protected. There are no wires and chargers on the floor or the arm of the chair, and your kid will not unplug your refrigerator while searching for an outlet that no one is using. This is a good place to store rechargeable flashlights and other small appliances. Again, the obvious organize idea is to use square containers that fit easily in the space and organize the contents based on the type of job they do. A container for cleaning the kitchen may contain a soft scrub cleanser, glass cleaner, disinfectant, and floor cleaner. Place a tension rod under the sink. Place it tightly from left to right. 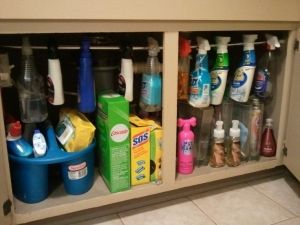 Use the spray handle to hook the various cleaners within easy reach, using less space, and easy to see labels. This is like adding a second shelf inside a shelf. You have everything you need and it is all clearly visible. You already know about the idea of storing food in plastic containers with tight-fitting lids. This makes it easy to keep cereal, crackers, and pasta fresh. By adding soda caddies, you can load it from the back and make sure you use the oldest can first. Outdated can goods is a big waste of money. You may have installed small plastic shelves designed to keep small items secured. 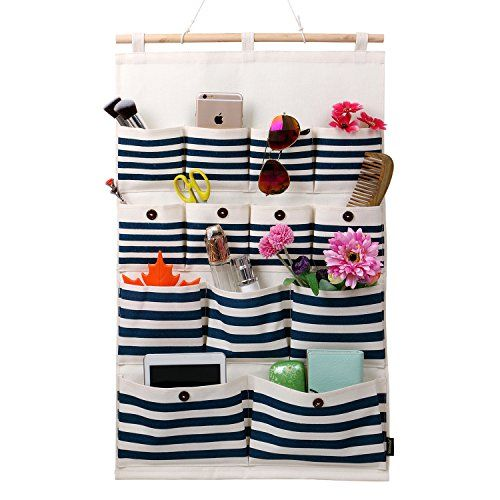 By using suction hooks to the door and use them to hang a travel cosmetic caddy. This gives you several “On the go” pockets. There are a million uses for these pockets. Place salt and pepper shakers in one for fast access. Put your vitamin regiment into individual little baggies and place them in a pocket, grab the bag and never forget. Make yourself coffee go kits. Place your creamer cup, sweetener, or sugar in a snack size baggies and include a stir stick. Grab a bag on your way out the door and you are ready to mix your coffee on the go. If you are like most of us, you probably have dishes and kitchen items that are for a specific use. This may be holiday settings, platters, and special wine glasses. An easy DIY project or a simple job for a handyman is to remove the section of the second shelf so that the one area in the top of the pantry is double height. Using metal racks, arrange your holiday dishes standing vertically. Wine glasses are easily hung by the stem with slides installed at the top of the pantry. Use a can caddy to hold glasses or goblets. To keep them from getting chipped, place each glass inside a tube sock and then place them in the caddy. There are times when the kids want a snack, and you have safe snacks waiting. Use adhesive office file trays stuck to the lower door or wall of the pantry. Use a label to mark then with contents or put one for each child with their name. Place juice boxes, gummy candy, crackers, or raisins in the tray. 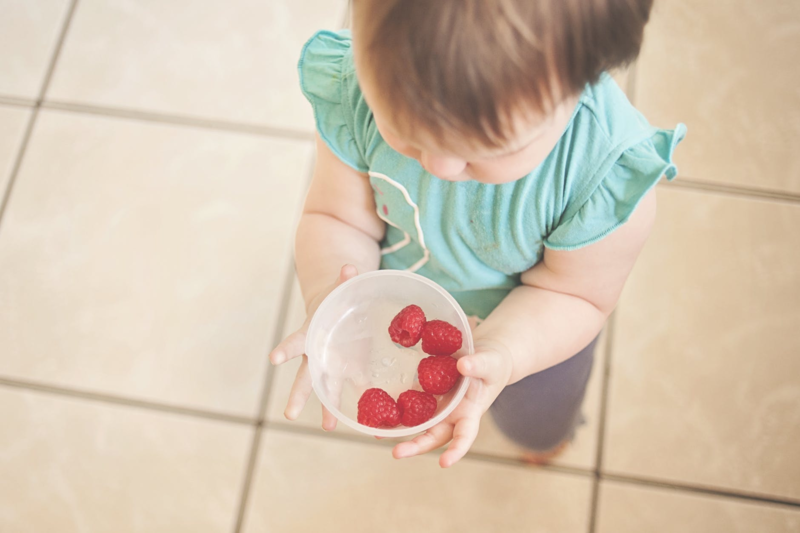 Your child will love the fact that they are allowed to get (just one) their own snack and you know in advance that the snack is good for them. This is a good way to teach your kids how to be responsible. There are many ways to organize your kitchen given space you already have. It is just a matter of thinking outside the box. Walk through the kitchen wares at your favorite department store. Don’t stop there. Walk through the area where bathroom organizers are shelved. You can even look through the hardware section. There are always ideas for the garage. Once you have a plan, put it together and make it work for you. You will never run out of space and you will continually see new ways to make the most of the space you are working with.